Proud To Care is a campaign which is helping people apply for Care, Support and Reablement jobs. The hub is open Wednesday – Friday, 11am-3pm and is located on the ground floor. Drop in and meet employers face-to-face to discuss a range of career opportunities including full-time, part-time, flexible hours, apprenticeships and volunteering. 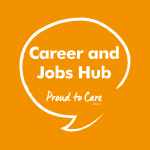 You can also get free, impartial careers information and advice from the Jobcentre Plus careers advisors and National Careers Advice. If you have the right values and are great at communicating with people, you can start your career in care. The rest can be learnt and from there, it's up to you, there are endless opportunities to progress your career. Be Proud to Care and make someone smile every day!